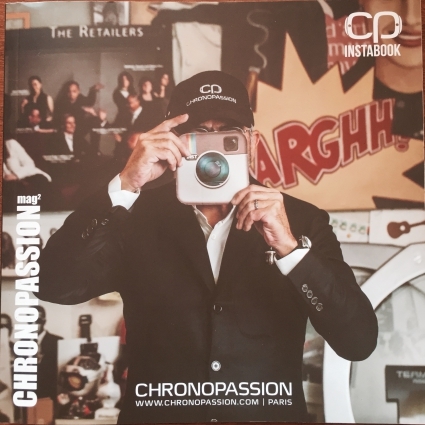 Chronopassion magazine n°2 : "INSTABOOK" , the images have been selected just as carefully as the watches themselves. Each one is numbered, and if you would like to know more, simply send us an email telling us the number of the photo. We hope you will have as much fun browsing through our InstaBook as we had putting it together. And why not also follow us on our Instagram account? Updated daily, it has the same regard for excellence and features designs that will always have the capacity to surprise you. In issue 1 of our magazine we elected to share our Chronopassion with you through a host of interviews and full-length feature articles. These were required to introduce our philosophy and our different brands, whether household names or smaller and more exclusive. For issue 2, we have preferred instead to focus on the image. No lectures. No Comments. No frills. Just beauty and technology displayed throughout these pages. In this InstaBook, the images have been selected just as carefully as the watches themselves. Each one is numbered, and if you would like to know more, simply send us an email telling us the number of the photo. We hope you will have as much fun browsing through our InstaBook as we had putting it together.